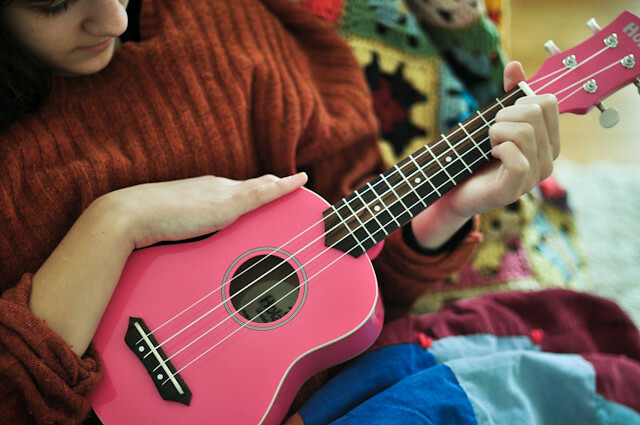 number twelve off the list: own a pink ukulele. because, january. because, february. because, I don't know. I just wanted one. it's a very twee sort of thing to want to own, I realize this. and I will admit to something else. I did not even think about actually learning how to play it. I just wanted it. I wanted to hold it. and look at it and take photographs of it. I wanted it like a kid wants candy. because it's sweet and pretty and good, because surely it would lead to happiness. but when I got a little bit of birthday money (an amazon gift card, actually, thank you sweet in-laws), all I could think about were the practical things I needed. a new kitchen knife, for one, because I have been cutting fruits and vegetables with something akin to a butter knife. I have lost my mind over the cutting of pineapples, have thrown my fists up in the air over a pile of carrots. people, I need a new kitchen knife. desperately. and new sneakers. I have worn mine down to the nubs and my body has had it. she tells me this after every walk I take. I need new sneaks. but I think you know how this story ends. to be fair, I researched the heck out of trainers and a most excellent kitchen knife sat in my little amazon cart for weeks. in the end, I went for the pink ukulele. because, of course I did. and when it finally arrived in the mail, it made me as happy as I thought it would. happier, even, because I've started to teach myself how to play. at night, of course, after everyone has gone to bed and the house is quiet. and you know what else? ava has started to play too. I hear her plink plink plinking away and it fills me with so much happy that it just spirals right out through the top of my head. and we don't really know what we're doing, we're probably doing it all wrong but we're making up silly songs and we're learning chords and strum patterns and at least now there's a little bit more music floating around these parts. dang it if it hasn't been the best thing to happen to this house in months. also? favorite pink thing, ever. ever. of course, I still curse every time I cut into a pineapple and wince a little bit after a long walk but I'll take it. because I don't know what we did before this little pink ukulele. I really don't. Oh my goshhhhhhh yay yay yay yay! I play a little blukulele and it is the love of my life. And I totally learned it on my own. Just find the chords for the songs you want to play and learn them! It is the most adorable, portable instrument that you will never want to leave behind. And it looks freaking amazing in every picture it ends up in. ESPECIALLY with my Holga, so your Polaroids are about to have a special treat! this is so good. sometimes you have to give yourself a gift that serves no purpose--except that it does, because it makes you happy. which is everything. Yay! I got a purple one for my daughter last Christmas. It wasn't on her list, but I knew she'd love it (me too). This was an easy song to learn...http://www.youtube.com/watch?v=3-EVN2NGSso That guy rocks his ukulele. I'm so happy for you! oh little ukelele i love you! So, so sweet. My super-exciting work bonus went to a new Epson R2000 that I have such high hopes for but that I'm more than a little afraid of. I think I need to take a note from your book and strum a few chords each night until we get to know each other... Have SO much fun with your new little uke!